CDE fellows are required to participate in the Williams CDE Meal Plan, which includes 21 meals per week when the College is in session. Breakfast and lunch during the weekdays are served at the CDE building; dinner and weekend meals are served at the other campus dining halls. While not all tastes can be accommodated, attempts are made to meet specific dietary requirements. Soup, rice, salad, meat (chicken, beef, lamb or pork), fish and vegetarian entrees generally accompany every luncheon. Generally, Halal meat is available at most meals. Coffee, tea, and hot chocolate are available most of the time. Fellows have the option to prepare meals in the communal kitchen when the dining halls are closed, and often cook meals together to celebrate milestones in the academic year or holidays. 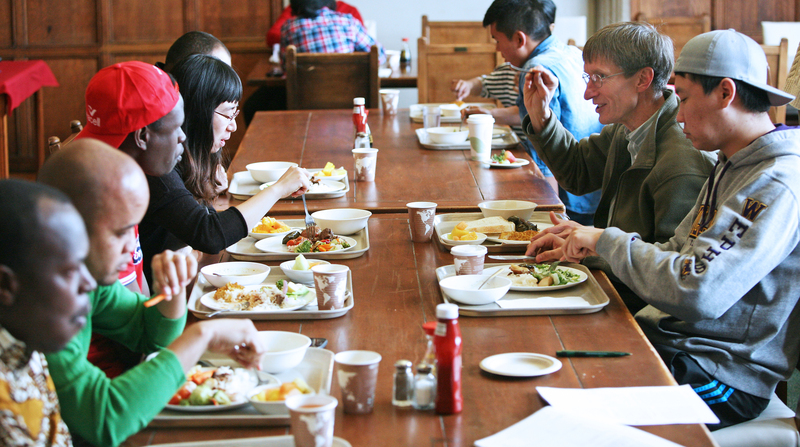 The CDE building has a spacious dining room where fellows relax and eat while discussing recent classes, catching up on the latest news, or enjoying conversation with one another, CDE faculty, staff and undergraduates, who often join them for lunch. For meal and board charge estimates see Costs. No meals are served during the semester breaks, which include winter vacation (December and early January), and spring break (10 days in March).